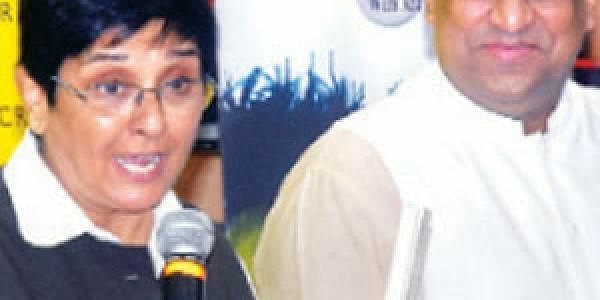 Kiran Bedi, the first and highest ranked woman police officer in India and at the United Nations and winner of the prestigious Ramon Magsaysay Award, the Asian equivalent of the Nobel Prize, has written another book -- Broom & Groom, with writer and television personality Pavan Choudary. Keeping in line with her image, the book addresses the inadequate civic sense in our society and offers Broom & Groom solutions. Broom & Groom is an expression of both anguish and hope. Anguish over the inadequate civic sense in our society. Hope, that once the society becomes more aware and sensitive, change will follow. It is a mirror for self-reflection and a behavioral compass which would improve community living and enhance our social and professional acceptance, globally. The launch and book reading, which was hosted by the Crossword bookstore at the City Center mall, was well attended by the city’s denizens, all of whom expressed much appreciation for the book.